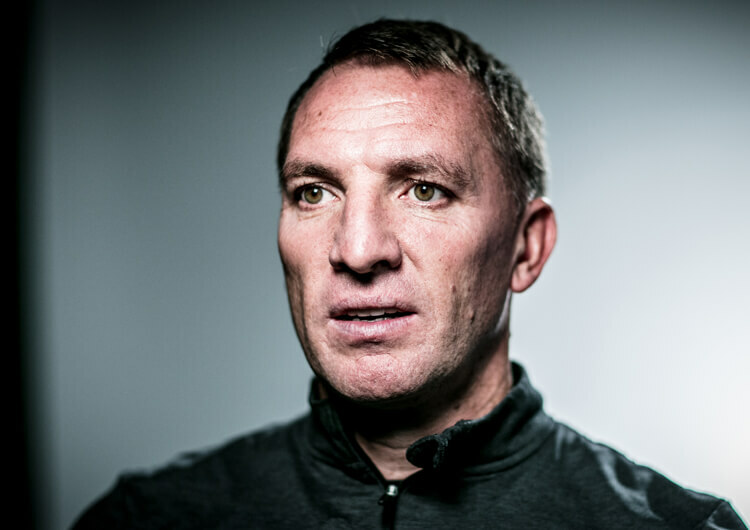 One of the games of the season at Anfield, with late drama and controversy only adding to a pulsating clash between two of the sides scrapping it out for the Champions League places. The seemingly unstoppable Mo Salah nervelessly gave Liverpool an early lead, but the Reds were unable to further capitalise on a dominant first half and looked like they would have to settle for a point when substitute Victor Wanyama unleashed a thunderbolt to equalise 10 minutes from time. The previously quiet Harry Kane won and then missed a controversial late penalty, before Salah netted a wonderful individual effort in stoppage time. Pandemonium at Anfield turned to despair, however, as Kane stepped up to score from the spot – his 100th Premier League goal rescuing a point for the visitors. Jurgen Klopp started his Liverpool team in a 4-3-3 formation, which shifted to a 4-1-4-1 in the defensive phase, Jordan Henderson protecting the defence behind a midfield line of Sadio Mane, Emre Can, James Milner and Mo Salah. Klopp made a noteworthy decision in the last 15 minutes, bringing on Joel Matip for James Milner and changing his defensive structure to a 5-3-2 in a bid to close out the game. Liverpool’s first line of pressure, mainly Roberto Firmino along with Sadio Mane and Mo Salah, aimed to block off passes into central areas with the intention of tightening the space available for the Tottenham midfield. They would then press and aim to win the ball back in wide areas high up the pitch. After the substitutions of Milner and Henderson in the second half, however, they lost defensive strength in the midfield and allowed Tottenham an easier progression through the centre of the pitch – where Christian Eriksen in particular started to find more space. The Liverpool defensive line was concentrated in their own third, always aware of the threat carried by the Tottenham attackers. Virgil van Dijk impressed both for his interceptions on the ground and his dominance in the air, although the team’s gameplan to defend in numbers in central areas did leave more space for Ben Davies and Kieran Trippier to advance in wide areas for the visitors. 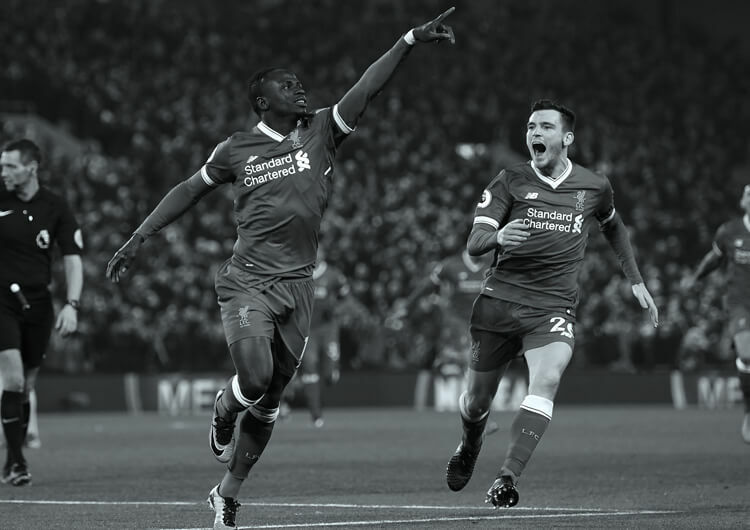 It was from a cross that Spurs equalised, Victor Wanyama advancing into space created by the absence of Henderson and Milner to thrash home an unstoppable shot. In attack, the home side looked to build short from Loris Karius in goal to his centre-backs, van Dijk and Dejan Lovren. Tottenham pressed high in a bid to prevent this, forcing Karius to go long and Liverpool to look for numerical superiority in the midfield when battling for the second ball. 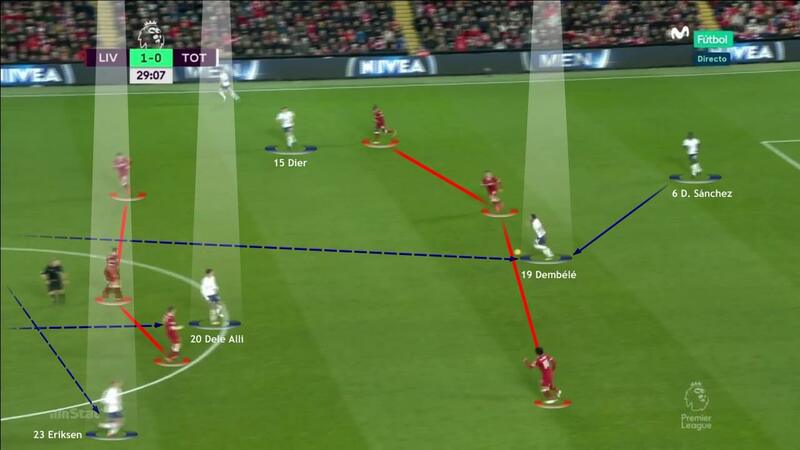 Salah and Can in particular had freedom to change their positioning, moving around in attack and occupying spaces in behind Tottenham’s line of pressure. They would also look wide, where Sadio Mane and the offensively minded Trent Alexander-Arnold looked to drag defenders out of their shape and create space for their midfield runners from deep. Liverpool started in a 4-3-3 that shifted to a 4-1-4-1 in the defensive phase, Jordan Henderson sitting behind a midfield line of Sadio Mane, Emre Can, James Milner and Mo Salah. In the last 15 minutes, however, Jurgen Klopp made a big decision to replace Milner with Joel Matip and change his defensive structure to a 5-3-2 (above) in a bid to close off the game. 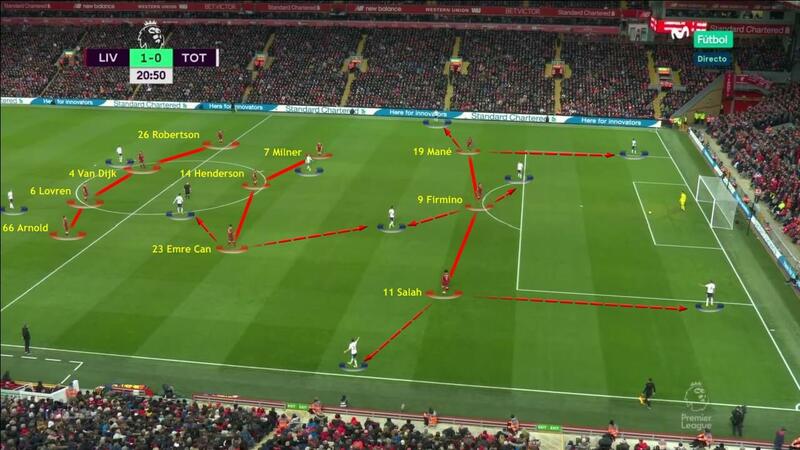 Klopp’s gameplan made life difficult for Tottenham’s attack. 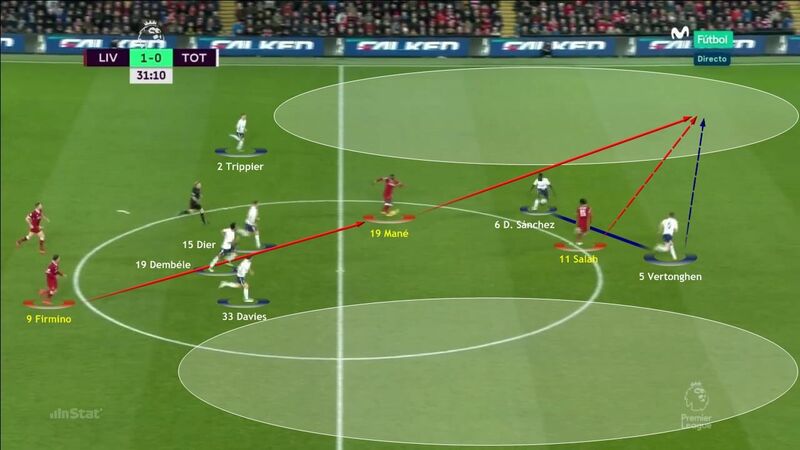 Liverpool’s first line of pressure – Mane, Roberto Firmino and Salah – created difficulties for Tottenham’s first line in the build-up, forcing them to go direct. Liverpool’s defensive line was always aware of the danger the Tottenham forwards could cause. Virgil van Dijk’s performance should be highlighted for both his interceptions and success in aerial battles. 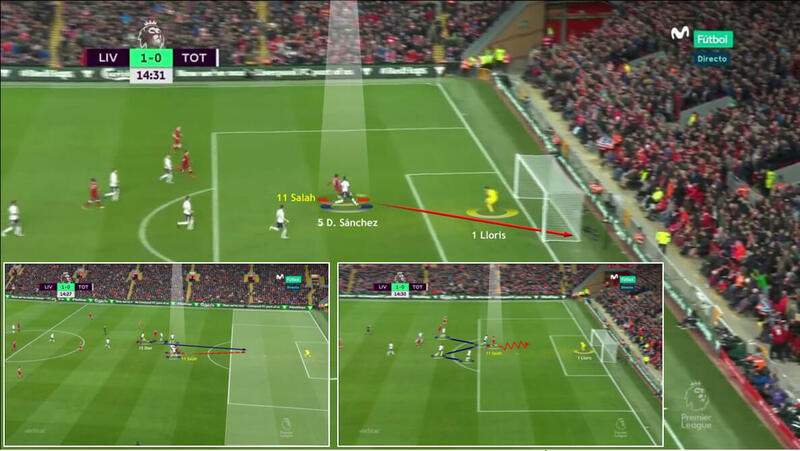 Liverpool’s high press forced individual mistakes from the Tottenham defenders, including Eric Dier and Davinson Sanchez – both of whom were at fault in the build-up to Mo Salah’s opening goal after three minutes. 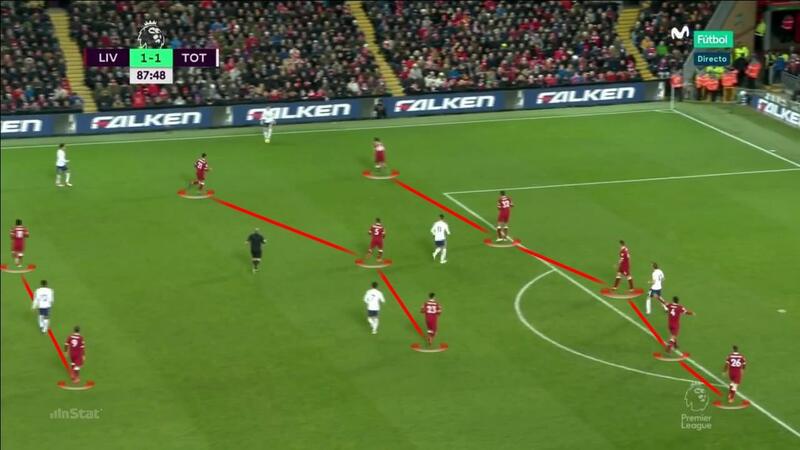 Liverpool often created gaps in between the Tottenham defensive line, which made it difficult for them to deal with the home side’s midfield runners. 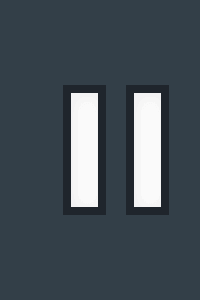 Here, Trent Alexander-Arnold finds James Milner in the space between the Spurs centre-backs. 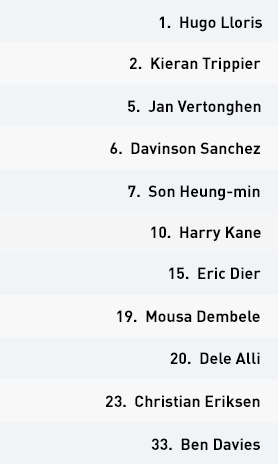 Tottenham lined up in a 4-4-2 diamond formation, with Son Heung-min joining Harry Kane up front. 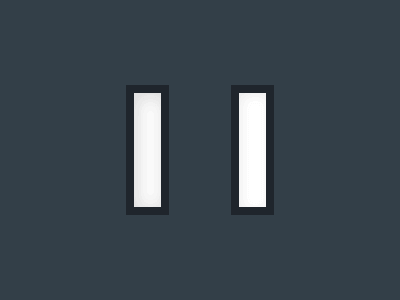 The formation shifted to a traditional 4-4-2, as seen here, in the defensive phase. 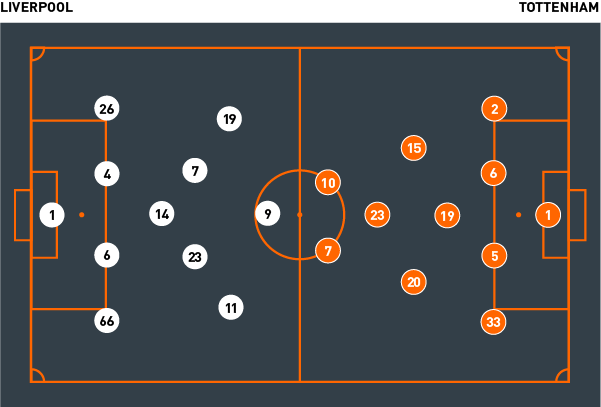 Tottenham’s first line of pressure, Kane and Son, positioned themselves so as to prevent passes into central areas, where the midfielders attempted to cover their opponents man for man. The visitors had difficulties in the defensive transition due to the speed of Liverpool’s attackers, with Firmino, Salah and Mane often finding space. The withdrawal of Mane for Oxlade-Chamberlain meant Tottenham were less exposed in this area of the game, however. 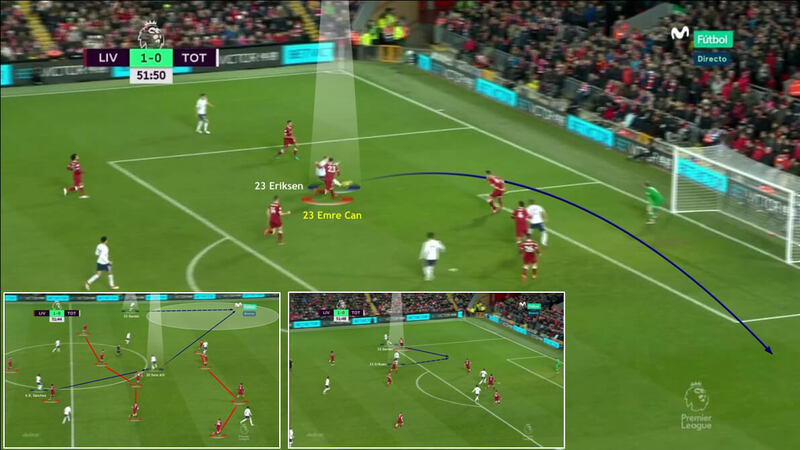 Players like Dele Alli, Mousa Dembele and Christian Eriksen changed their positioning to open up different passing lines towards the Liverpool goal. 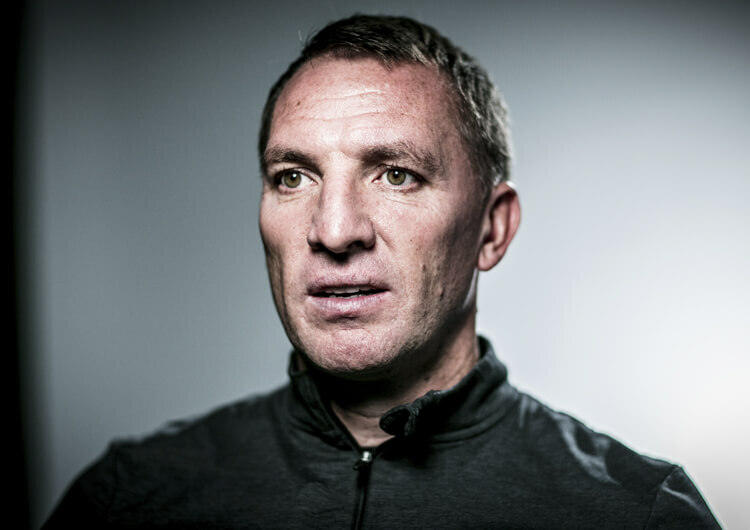 They found this difficult in the first half, due to the Liverpool gameplan, but enjoyed more success after the break. 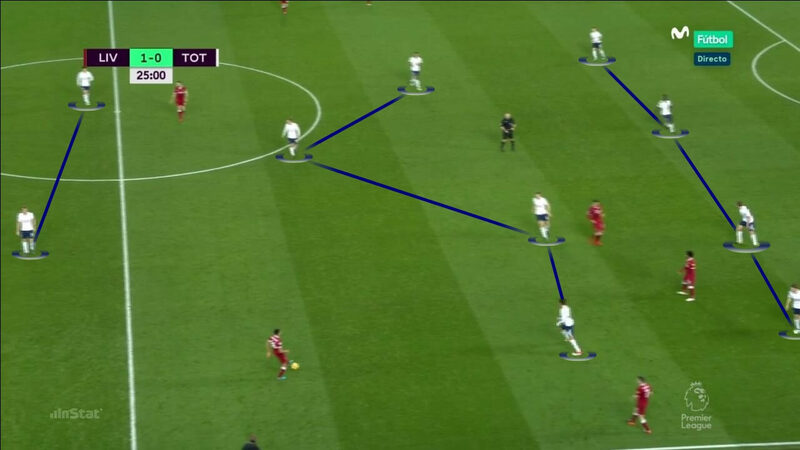 Due to Liverpool’s defensive plan to pack central areas, Tottenham had to move the ball wide and attempt dangerous crosses into the box. Eriksen fails to find Kane here, but it was Liverpool’s failure to deal properly with a cross that led to Victor Wanyama’s thundering equaliser. Mauricio Pochettino lined Tottenham up in a 4-4-2 diamond formation, which shifted to a flat 4-4-2 in the defensive phase. Tottenham’s frontline of Harry Kane and Son Heung-min positioned themselves so as to prevent passes into central areas, where their midfield teammates worked hard to stop Liverpool playing through their defensive system.  The visitors encountered a lot of problems on the flanks, however. They were regularly beaten by Mane, Salah and Alexander-Arnold in these areas, while Liverpool also managed to create gaps in between the Tottenham defensive line and force individual errors from the likes of Eric Dier and Davinson Sanchez – as evidenced in the opening goal, when Salah pounced on a misplaced Dier pass to slide past Hugo Lloris. In attack, Tottenham tried to play out from Lloris in goal – but the Liverpool high press was so effective that they had persistent problems in doing so throughout the first half. At the base of the diamond, Mousa Dembele was tasked with orchestrating the visitors’ build-up play and providing continuity between defence and attack. As the game progressed, particularly in the second half, he and Dier were able to find Christian Eriksen and Dele Alli – whose movement improved as the game went on – in space in more advanced areas. 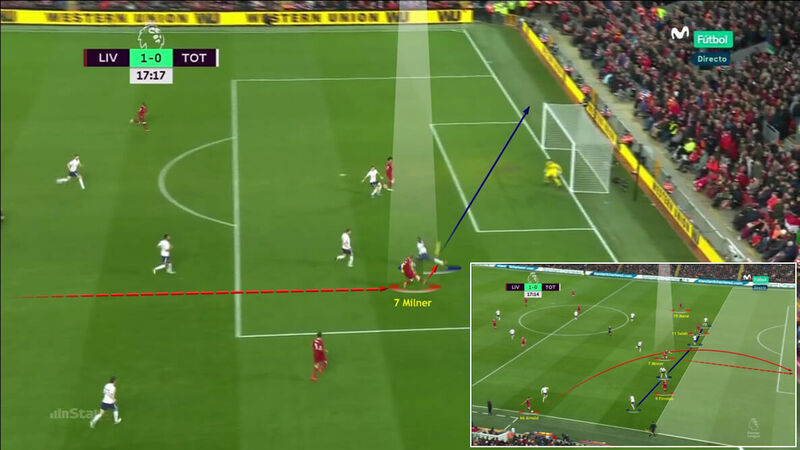 Liverpool’s defensive plan to play narrow and pack central areas made life difficult for Tottenham to provide Harry Kane, who despite his late equaliser struggled to make an impact either on the ground or in the air against the impressive van Dijk, with his usual service. 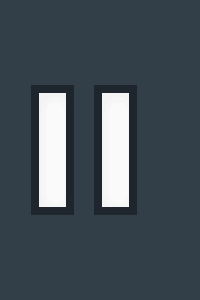 The home side’s decision to move to three at the back actually served to expose them in midfield, however – this can be seen with the first equaliser from Victor Wanyama, when he advanced unmarked from the second line to score from a Karius parry. Jurgen Klopp’s gameplan made life difficult for Tottenham in attack. Liverpool’s first line of pressure created difficulties for Spurs in the build-up, forcing them to play direct into Harry Kane – who had little joy out of aerial duels against Virgil van Dijk. Despite giving away the late penalty, van Dijk was excellent in both the defensive and offensive phases. He continually intercepted Tottenham passes, won his aerial battles and proved dominant in dead-ball situations. Loris Karius delivered a very good performance. He pulled off some excellent saves, both in one-and-one situations and from the penalty spot, and was much more secure in dead-ball situations. 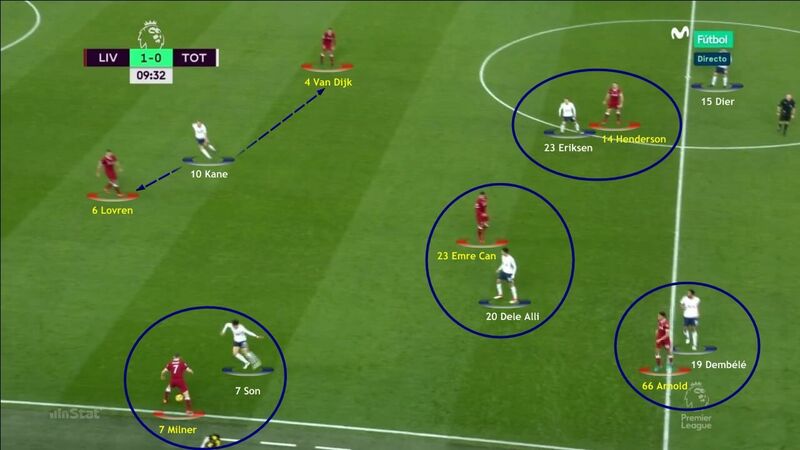 Tottenham struggled to find space in attacking areas as a result of Liverpool packing central areas and cutting off the passing lines through the midfield. This improved greatly in the second half, when the movement of Dele Alli and Christian Eriksen gave Mousa Dembele more options in possession. Spurs were able to take advantage of Jurgen Klopp’s substitutions, which did not help the home side at all. 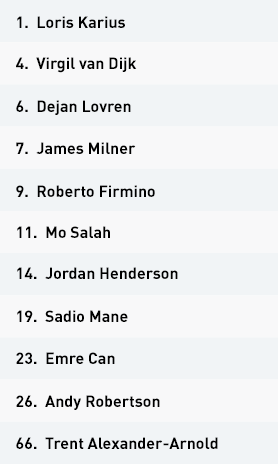 Replacing Jordan Henderson and James Milner, and moving to three at the back, actually played into the visitors’ hands by giving them midfield superiority.